It's that time of year where families get together and enjoy each other's company and some really good food. From our family to yours we hope everyone has a safe and happy Thanksgiving! We are putting the finishing touches on Publish 103 after some great public testing events and anticipate the next update to be on TC1 by Friday November 16, 2018. Following our return from the Thanksgiving Holiday we will continue with our Origin release schedule with an anticipated worldwide release of December 4, 2018. 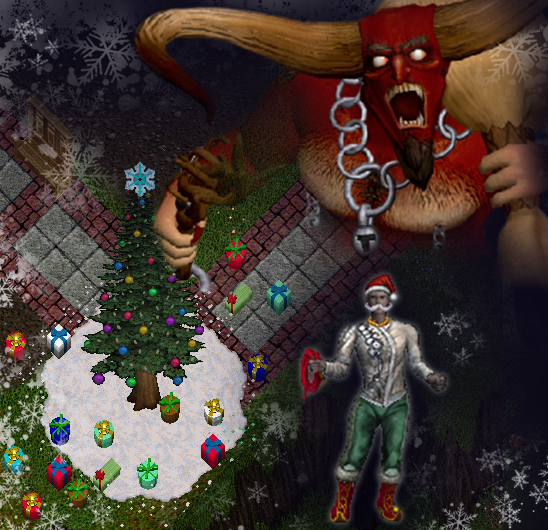 Publish 103 is full of exciting new features including new rewards for the Artisan Festival, Holiday Gifts, new Classic Client functionality and the new Krampus encounter! Be sure to check out the full publish notes for all the details and head over to TC1 if you haven't already checked it out! We are also pleased to announce the UO Swag store that allows you to purchase many items to show off your love of Ultima Online. If there is any new art you would like to see available for that favorite shirt or mug, or even a nice canvas picture please send me your suggestions at my regular email. Visit TC1 to check out these great designs and look for them in the house placement tool with Publish 103 goes WW! With all the gifts moving on trade routes between cities during the Holiday Season there have been sightings of strange creatures ambushing those routes - including the vile Krampus! The true nature of this beast is unknown and reports vary wildly, yet great treasures can be had by those who are brave enough to best him! New weapon type - whips! New craftables wearables - hats, boots, talons, and earrings! Krampus' Coin Purse - with a chance for one of Krampus' trinkets inside! Jaana patted Karelia on the head. “Don't be afraid. It’s just a mask.” She took it down from the wall to help the little girl see it better. 1. Would it be possible to have hair added to Mannequins? We have requests for enhanced mannequin functionality for a future publish, we've added the ability to change hair with that request. 2. I want to be able to ride an ethereal for free since gargoyles can fly for free without sacrificing a pet slot. We are sorry but this is not going to be changed. Each race has a benefit and we have no plans to change racial abilities at this time. 3. I want to train detect on a pet, is that possible? This is not something a pet can gain in so we are not going to be adding this to the list available for pet training. 4. Britain presents some issues with guard zones for Grimms & trade ambushes because of how massive the guard zone is - can this be fixed? This issue should be resolved for trade ambushes in Publish 103. 5. Since the lever in Khaldun is broken on many shards can you fix this? It would be easier to do away with the levers to get into the secret areas and just open the door for everyone. We have already removed the door from several shards and will be doing it on the rest. 6. Is it possible to add door stops to keep doors open? We have added this to the backlog we can do for a future publish. 1. If you have an account that was terminated by CS over a year ago and would like to have it back please contact support here and give them the details and identify the account as yours, depending on the termination we will remove the restriction from your account so you may open it again. 2. All Sovereigns purchased from Origin have to be entered on the Account Management page. You can not enter these in game. Please know that you can not unlink the account and link it to another account with Sovereigns on your accounts. 3. Anyone that is trying to reopen an account please make sure you send all the information to support@ultimaonline.com so we can have a record of this. In the original request to support if you do not know your secret word please ask for a hint. Give them all the information to identify the account as yours so there will not be a lot of delays. 4. If you are having issues with your Origin purchase follow this link to resolve the issue..
5. If you have any in game questions or issues submit an in game help request for a GameMaster to contact you. 6. For any feedback to content put in game please send it to UO@broadsword.com. 7. Regarding Origin orders, codes, and third party resellers. When prompted for a product, choose Origin. Next choose your platform, and select ‘Orders’ as the topic. You can further specify your issue in the subsequent fields before speaking with an agent. 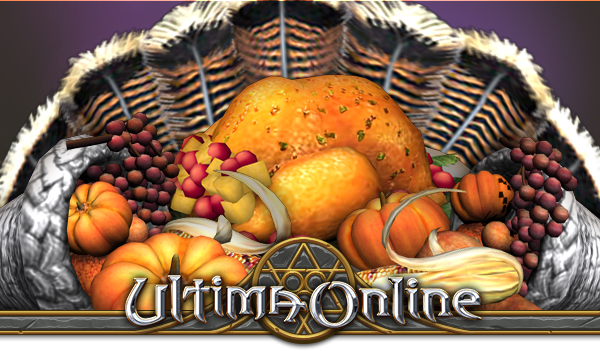 We would also like to reiterate that the Origin store is the only guaranteed provider of codes for Ultima Online. The validity of a code purchased from a third-party seller (be it a friend, in-game acquaintance, or recommended site) cannot be guaranteed. Furthermore, any codes we find to have be fraudulently obtained will be disabled and an account that applies any of these codes will have that code removed from said account. This can result in the loss of gametime, character slots, expansion access, Sovereigns (and the items purchased with them), in-game items and more. Please be advised that we cannot assist with any issues stemming from codes purchased via non-Origin means; you will be required to contact the vendor from which you purchased the code for further assistance. When you get to the page asking which payment method you would like to use, instead of choosing to add a card, select the 'Manage Accounts' option in the top right corner of the page. This should load a new page that will contain your previous credit card information. You can now re-enter your credit card with the updated information by using the 'Add a card' button.